Following their teaser, Swedish lighting manufacturer Profoto has officially announced the addition of high-speed sync (HSS) support to its automatic location monolight, the B1 AirTTL 500. Up to now the unit has offered i-TTL and E-TTL metering — automatically adjusting light output to give correct exposures — as well as manual wireless remote control. The new feature permits the use of flash at shutter speeds above 1/250 second, making it easier to overpower ambient light or use wide lens apertures outdoors. Profoto says that its HSS “has been tested for all common camera models” from Canon and Nikon, adding that the high-speed sync support in the B1 monolight “has all of the benefits and none of the limitations” of speedlight-based HSS, which typically suffers from restricted light output. Using HSS mode, the B1 can flash at shutter speeds up to 1/8000 second without banding in images. Unlike most of the other fast-sync solutions for studio lights at the moment, Profoto HSS is a series of fast flash pulses that mimic continuous light throughout the exposure (the same way HSS or Auto-FP Sync works in Canon and Nikon speedlights). Other systems, such as the Priolite MBX HotSync or Nicefoto N-Flash, seem to use a slightly different technology that more resembles PocketWizard’s HyperSync. Interested in the Profoto B1? It is available from B&H for $1,995. HSS and TTL support are provided via the Air Remote TTL-N/C ($395), which sits on your camera and communicates wirelessly. 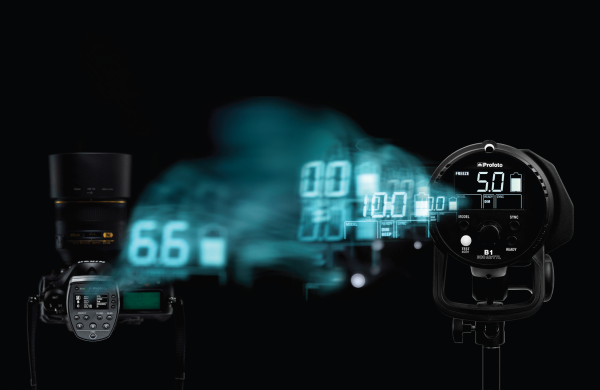 Visit profoto.com for more information and to download the firmware upgrade for your existing gear. Is this a feature you’ve been waiting for? Leave a comment below.